2019 is just around the corner and with it Qualcomm's next flagship SoC based on the 7nm manufacturing process. So far, information about it has been scarce, but one thing keeps popping up - the 8150 name suggesting that the company is looking to change its naming convention once again. Just the other day, Android 9.0 Pie system files hinted at the Snapdragon 8150 and now a Bluetooth certification document confirms it. 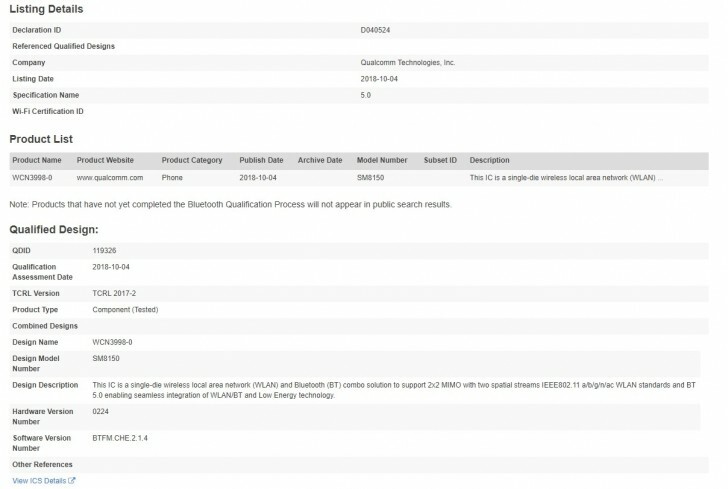 The listing mentions Qualcomm SM8150 supporting Bluetooth 5.0 and it seems that the chip went through the certification process just yesterday. But don't get your hopes up too high as there's plenty of other steps before the chip is released in an actual product. We hope that the wait will be worth it, though. is it new chipset name for snapdragon 855 or new line ? Its just a company. And we all know what a company is after: money. Im sure they make more money using the designs from ARM than invest on custom ones.